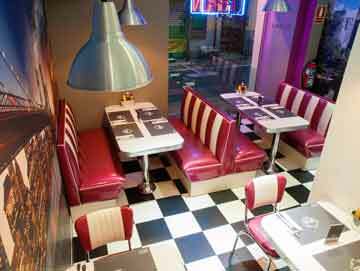 Skyline is a modern diner, a little piece of USA in the center of Madrid. Our thrill is to move you to a city corner of a big American city, where from there you can gaze at some spectacular views, listen from the distance to the city’s noises, relax and enjoy of a simple but delicious food. From our burgers, which we elaborate daily with first quality meat, one by one, to our desserts, handmade and 100% naturals, our dishes bringing the American handmade kitchen’s food. As well as our carta, we have taken care of every detail of our restaurant so that we can take you thousands of kilometers from here, so you still feel as well as in house. If you still prefer to stay at home, you can order your food and pick it up on our restaurant or make an order so that we deliver it to your house: the Skyline spirit will travel with us. We hope you enjoy our special panorama. Welcome to Skyline diner! We are not friends of mega chains, big marketing campaigns or investment founds: we love handmade, things well done, restaurants with little menus but with basis. We dislike from restaurante which under the “gourmet” adjective behind serve burgers at a sirloin’s price. We do not need paraphernalia or fireworks: we only look forward enjoying a really tasty burger, with its sources and its potatoes, epic! We ran away from brick walls, fake vintage decoration without sense and industrial design without personality just because it is trending. We reclaim only three things: quality food, an unique atmosphere and good mood. And all at a reasonable price . Are we really asking so much?